This Lift Professional – Hydrating non-surgical facial targets the seven signs of aging. 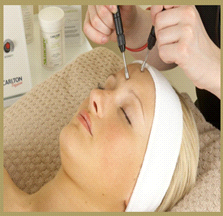 1) The lift professional firstly prepares and deep cleanses face and neck area ready for the second programme. 2) Blood flow is stimulated bringing oxygen and nutrients to the area and improving texture and preparing tissue for the lifting treatment. 3) Performing a Lymph drainage treatment which also encourages Circulation and helps detox the area of waste. 4) Contour Lifting This procedure Re-Programmes the muscle fibres by Shortening and relaxing them resulting in a reduction of facial Expression lines. 5) Firming lift - firms up and tones loose tissue which improves the Contours, texture and condition of the face and neck areas. 6) Application of collagen is applied over entire face and neck area to Encourage the natural regenerative process within the tissue and adds Elasticity, toning up the tissues in the face and neck area. 7) pH Balance Regulator which restores the skin's natural pH balance and Acid mantle. Finally a mask and luxury hydrating moisturiser is applied leaving the skin glowing and radiant. Also lifts the neck, breast upper arms. Safe, painless and extremely effective. Helps restore elasticity in ageing skin. Helps delay the ageing process. Alternatively as a treat you can book a (one off treatment) which will surpass any manual facial you have ever experienced and it will certainly deeply hydrate the entire face and neck areas like no other treatment you have experienced before.